Yesterday, during my new Willow Lampshade Sculpture Day, instead of my usual lunchtime tour of Coates English Willow I decided to change our itinerary and head into the Coates museum. I find the Coates basket collection a continual source of inspiration and intrigue. 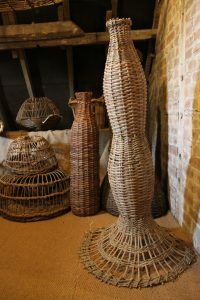 I wanted my students to gain a greater understanding of the techniques and skill involved in the objects within, and hopefully, like me, to discover and continually look upon basket forms in a new light. At the moment I am pursuing a couple of avenues within my own willow work. I’ve always been fascinated by sculptural lighting. Currently I’m investigating traditional forms of baskets, such as salmon kypes, bird cages and eel traps and giving them a new function as architectural lighting pieces. The advent of LED lighting has certainly come such a long way in such a short time… (Thankfully gone are the days when I taught myself lighting circuitry and soldered together LED nodes whilst playing with domestic solar panels!) Now we can showcase beautiful traditional basket forms in new and exciting ways. One of my all time favourite items in the Coates basket collection is an eel trap. For such a functional item this particular trap is so skillfully made, being highly technical and just aesthetically beautiful. I’ve always thought of this object as a swaying dancing figure, wearing an amazing frou frou dress! My students and I took a moment to ponder why the eel trap maker would go to such lengths of creation and decided that he must have had lots of long cold winter evenings to fill! I’m aiming to dedicate more of my time to making pieces inspired by the Coates collection that would sit perfectly in boutique hotels and galleries. Through a series of serendipitous moments I’ve also been investigating willow furniture. Whilst being aware of the willow furniture currently being made at Coates, and of critically endangered skills, (Jonathan Coate is the only English maker left of this particular type of Victorian / Edwardian willow furniture), I’ve long thought that there is room in the market for a new high end range of English willow furniture. My aim is to become skilled enough as a maker to learn techniques involved in creating willow furniture and in collaboration with a furniture designer create new and exciting chairs whilst adhering to the principles of the Arts & Crafts movement. As I grow older I more and more appreciate the talent and enthusiasm of my mum, not only a talented maker, re-seating rush and cane furniture, but an absolute lover of the Arts & Crafts movement. My teenage years were spent visiting as many National Trust properties as possible that contained Arts & Crafts furniture and caning chairs for pocket money, (even then I apparently charged a fair wage!) This I can now see contributed to my love of Pre-Raphaelitism and like my mum, an obsession for collecting and saving chairs. On deciding to move away from my family home, my mum took me for our first and only time to an auction together. I still remind her today of the moment when at that auction I fell in love with a battered Orkney chair and begged to bid on it but was unable to afford the then low reserve price. Instead my mum successful bid on a ladderback rush chair and was delighted that on winning we unexpectedly gained two ladderback chairs for the price of one. On getting them home my mum swiftly re-rushed one of them and I was sent on my merry way, moving into my first cottage with my only furniture consisting of 2 chairs and a utility chest of drawers! As I write this post at my dining room table, I sit on that same ladderback rush chair which must have been used nearly everyday for the past twenty years. Upstairs sits my other ladderback, which my mum only pointed out to me very recently had probably due to damp had at one time length on its legs chopped off, (In my naivety I thought it had been made for a small person!) 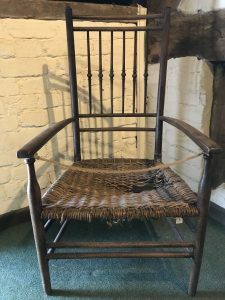 After attending the Heritage Crafts Association annual conference in March, at which I listened to a talk by rush chair maker Lawrence Neal, my thoughts turned to the chair collection in the Coates museum. Whereas ladderback rush seating is more widely known about, ladderback chairs have also been known to have willow seats. 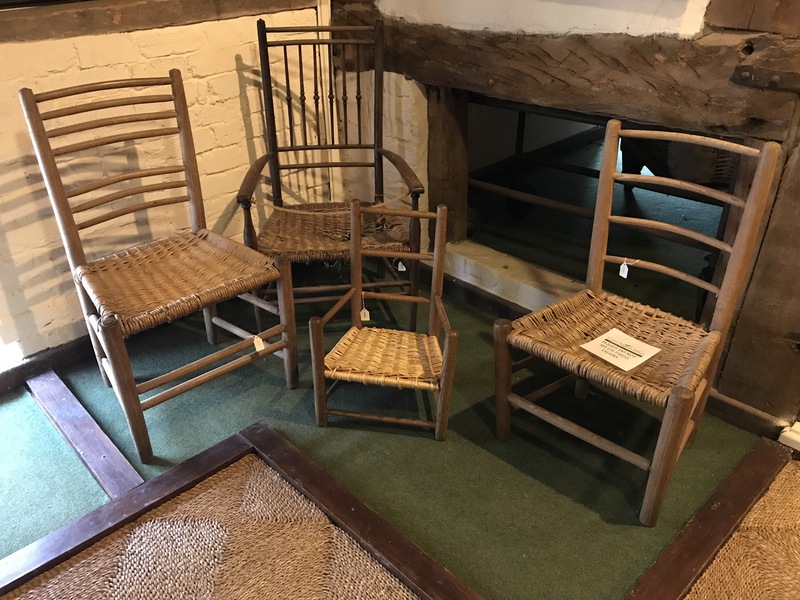 Low and behold it felt like a eureka moment when standing before the 4 chairs in the museum, I realised, thanks to Ann Coate’s research, that Ernest Gimson, a leader in the Arts & Crafts movement not only revived making ash chairs with rush seats, but also used woven willow. Lawrence Neal learnt his craft from his father, who in turn learnt from Edward Gardiner. Gardiner was encouraged to take up chairmaking by Gimson. So I increasingly find myself crouching down in front of potential Arts & Crafts chairs in the Coates museum wishing that at least one of them be designed by Gardiner and wondering if any of them originated at Gimson’s Daneway workshop in Gloucestershire. My research continues, I know it may seem incredibly nerdish, (as if us basketmakers aren’t this already!) but I’m so intrigued to find out whether or not the museum’s ebonised spindle back chair can be attributed to Liberty of London or Gardiner. I’m wondering if willow seating can be revived, if traditional willow furniture techniques can be saved and… where I go from here.